Morning Session: "Officer Wellness and Safety"
This course is a continuation of Phase I and Phase II that builds on the solid foundation of both the theories and practicum of Hostage Negotiations. This course is specifically designed to develop and enhance the fundamental skills of a successful crisis negotiator. Training will include a variety of advanced topics. This external course is being hosted by Miami Beach PD. 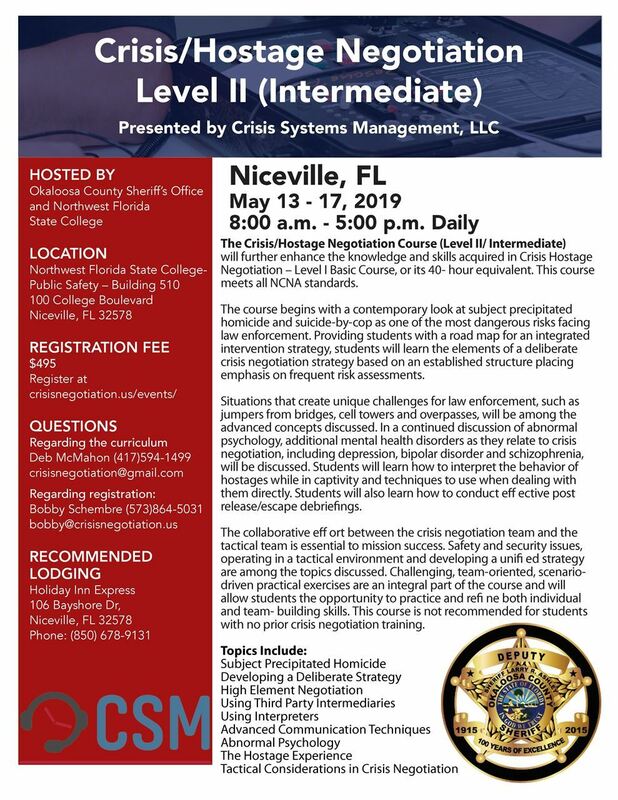 This 40 hour course will further enhance the knowledge and skills acquired in Crisis Hostage Negotiation Level I Basic Course, or its 40-hour equivalent. This course meets all NCNA standards. The course includes a variety of advanced topics and includes scenario-driven practical exercises. See the Conference Page for Details. 2019 Conference Signup is for New or Active Members in good standing. Be sure to read and review the breakout session descriptions under the Conference Tab before beginning your application as you will be asked to select the courses you will attend. If you don't know which one you want to attend, don't worry; you can change your mind at registration. CANCELLATION POLICY: Cancellation requests must be received by May 1, 2019. Cancellations before that date will receive a refund minus a $50 administrative processing fee. Cancellations received after that date, will not receive a refund. Transfer requests from one attendee to another will be honored until June 6, 2019, as long as a new registration is completed for the new attendee. All requests should be submitted to the FAHN Secretary by the appropriate due date. Go to the "How Do I...?" page if you have any questions regarding membership, event sign-up, or payment. Please review the Cancellation Policy for details regarding refunds and transfers. Thursday, October 18, 2018 Region 3 FAHN Training Event: "Negotiating Out of Your Comfort Zone"
Friday, September 07, 2018 Region 5 Training Event: "PTSD: Engaging Veterans in Crisis"